The cheesiest quesadillas around. Chorizo adds the nicest depth, and the guac really lifts it. 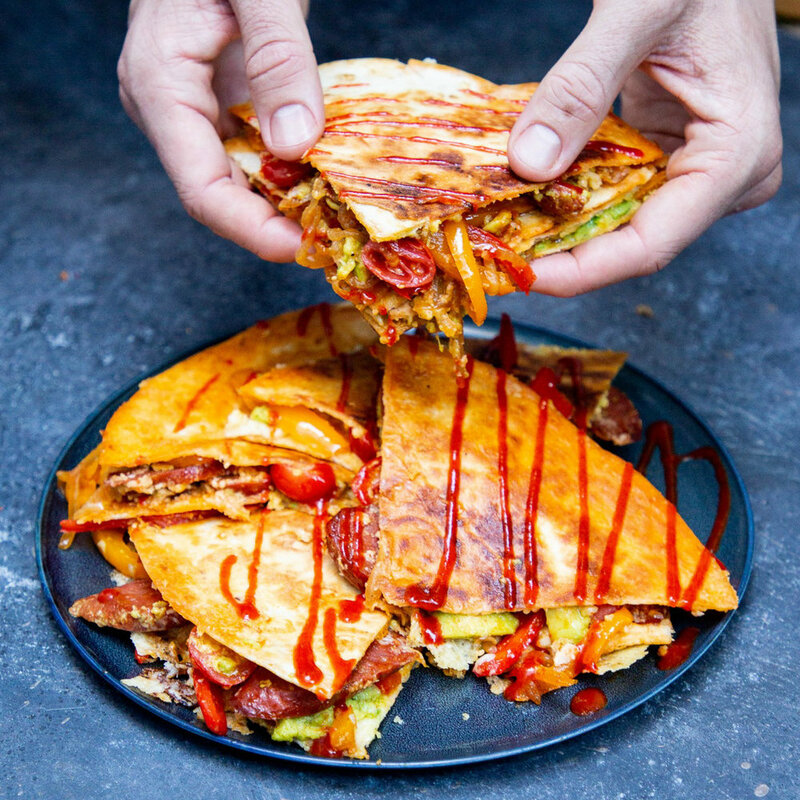 Keep checking the underside of the quesadilla to make sure it isn’t burning on the pan! Peel and slice the chorizo. Slice the onions and peppers. Get a frying pan on the heat, add some oil. Fry the chorizo until its releasing its oil. Add the onions, fry until then whack in the peppers. Give everything a good stir, cook until peppers are soft and everything crisp. Make a quick salsa. Halve the cherry tomatoes, squeeze in some hot sauce, lime juice, a drizzle oil. Season with salt and pepper to taste. Smash the avo with lime juice, salt and pepper. Scrape the chorizo mix out of the pan, whack it back on the heat. Put a wrap in the pan. Layer in grated cheese, the fried chorizo, onions and peppers, guac, then salsa. Top with more grated cheddar then place another wrap on top. Cook on a medium heat for 3-4 minutes until the bottom layer of cheddar has melted. Flip the quesadilla by placing a plate on top of it, turning the pan over and then sliding the quesadilla from the plate back onto the pan. Cook for a further 3-4 minutes. Repeat this 3 more times, adding a bit of oil to the time each time. Cut into quarters, serve with more hot sauce and lime wedges.